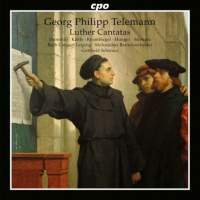 This disc brings together five cantatas closely associated with Luther, mostly on texts by Telemann’s long-term collaborator Erdmann Neumeister and reproducing a concert given at the Magdeburg Telemann Festival Days in 2012. Although the works span some 30 years, there are few discernible stylistic discrepancies. That said, their scoring is sufficiently varied that the transfer from concert to disc is straightforward. The most extended and festive work is Wertes Zion, sei getrost, which sees the composer deploy the sort of lavish resources that often find him at his best: three trumpets, two oboes, timpani and strings. An extended tutti passage, ‘Seid böser, ihr Völker’, alternates a number of textures in quick succession, including some massed effects that recall much older music, and follows this up with a richly scored but still light-footed aria for alto and tenor. After such an inventive period, the concluding ‘Halleluja’ in rondo form disappoints at first hearing, predictable and formulaic. That’s Telemann all over, his critics might say. Perhaps they’re right, but then each of these cantatas has something to offer, and even that finale has a way of insinuating itself into the mind’s ear. For what it’s worth, my appreciation of this disc has grown with repeated listening. The performances are zestful, the soloists and ensemble well matched. As they say, there’s a whole lot more where that came from.